Fostering excellence through discipline, challenge and joy, The Ridgefield School of Dance features a faculty of current and former professional dancers in Ridgefield, Connecticut. We offer pre-professional and recreational classes in Classical Ballet and Jazz. In addition to Ballet and Jazz, we offer Pre-Ballet, Contemporary, Lyrical, Tap, Musical Theater Dance, and adult classes along with Summer Dance Programs as an integral part of our curriculum. Our jazz program incorporates contemporary jazz styles that change and evolve with new trends in an upbeat learning environment that encourages students to express themselves and build confidence and self-esteem both in and out of the studio. Our pre-ballet classes introduce your child to the joys of dance. 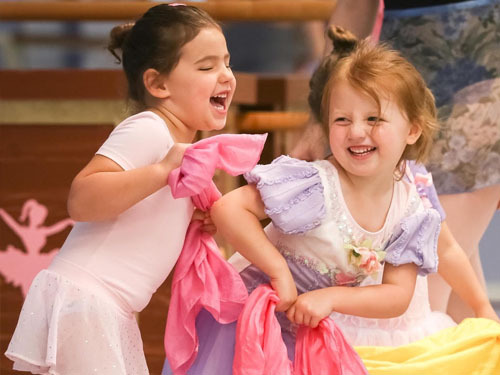 Classes build the foundation of a child's love for dance through play and storytelling. Designed as a first dance experience, children move as part of a group in a non-competitive atmosphere. All of our adult classes welcome those who are trying dance for the first time, those who are returning to dance, and those who are keeping active in their chosen technique. So, you think you can't dance? We prove that you can. Madeline, Paquita, and Brand New. Each year, The Ridgefield School of Dance presents a winter and spring performance in which all of the students are encouraged to participate. Our 2018 20th anniversary performance featured MADELINE, an original ballet based on the classic children's book with original choreography by artistic director Jessica Boelts. The Company and Ballet 6 performed the Grand Pas Classique of the classical ballet Paquita. The performance ended with Brand New by the jazz department. It was a fun weekend of dance. To learn more about our classes or to register, contact Executive Director, Alison Brown.